When you buy an overpriced medicine at the pharmacy, a complex network of players has taken a quiet cut. They aim to keep it that way. America’s ugly drug supply chain. This maze of companies profiting off your prescription drugs is intentionally mysterious. That keeps profits high and scrutiny low. Hover your cursor over the plus signs below to learn more. The manufacturer establishes the list price from which discounts and rebates are negotiated with pharmacy benefit managers. Increasing list prices protects the drug maker in these deals. PBMs manage prescription drug benefits and negotiate discounts and rebates with manufacturers. The PBM often makes more money on percentage rebates from high-priced drugs. How much of those savings actually end up with the consumer is a matter of fierce debate. Many specialty pharmacies are owned by PBMs. They handle high-priced medicines that require special handling. The pharmacies negotiate directly with drug manufacturers for discounts and keep a cut for themselves. Wholesalers store medicines and sell them to hospitals, pharmacies, physicians and other providers. They do not set prices but take a cut of sales. Insurers and self-insured companies contract with PBMs to manage prescription benefits for their members. PBMs then negotiate rebates and discounts with manufacturers and pass on an unclear portion of the savings to insurers that can help lower premiums for consumers. PBMs own many mail-order pharmacies. They negotiate directly with manufacturers for discounts. Retail pharmacies purchase drugs from wholesalers and manufacturers. Pharmacies negotiate with PBMs to be included in covered networks and accept set reimbursement rates to participate. In the case of generics, the copay is sometimes more than the price of the medicine. Many doctors purchase drugs to administer in the office, like chemotherapy medications. These medications are obtained from manufacturers or wholesalers at a discount and reimbursed by insurance. The current system sometimes makes it more lucrative for doctors to prescribe higher-priced meds. Hospital pharmacies are part of group purchasing organizations to maximize their buying power and get better discounts. Hospitals then bill Medicare, Medicaid and commercial insurers at negotiated rates. No insurance? You may end up paying full freight. Living at the bottom of the supply chain means consumers (and their insurers and employers) are covering the payments to all the middlemen above. The result is historically high drug prices. That prescription medicine pill in your palm has a story to tell. Middlemen in the drug supply chain would rather you swallow it and not ask questions. The key players historically have used their market and political clout to resist attempts to lift the veil so they can protect high prices. President Trump took direct aim at the problem when he unveiled his plan to lower drug prices on May 11. The administration’s blueprint is long on ambitious proposals about retooling the drug supply chain to benefit consumers. Even Health and Human Services Secretary Alex Azar, a former top executive at Eli Lilly and Company, is clear about the challenge and the inevitable pushback from the industries involved – including manufacturers, pharmacy benefit managers (PBMs), wholesalers and pharmacies. To get a sense of how the price of that pill in your hand was set along its journey from drug maker to you, you need to start at $457 billion. That’s how much the retail pharmaceutical market is worth in the United States each year. But gaining further clarity on the inner workings of the supply chain requires digging between guestimates attempted by academics or industry-funded studies that point the finger of blame conveniently elsewhere along the way. The drug industry trade association PhRMA has launched a publicity campaign called “Let’s Talk About Cost” and asserts one-third of brand drug’s price is rebated back insurers and pharmacy benefit managers. PBMs negotiate discounts with drug makers on behalf of health insurance carriers and self-insured companies, unions and school systems. The largest, CVS Caremark, Express Scripts and OptumRx (a division of UnitedHealth Group, which also operates the nation’s largest health insurer), currently represent about three quarters of all insured patients. Together, the companies posted $17 billion in profits in 2017. Considering the total size of the US drug market, there is clearly more money landing somewhere. A 2017 study by the USC Schaeffer Center for Health Policy and Economics analyzed the financial statements of publicly traded companies along the supply chain and tried to estimate where the profits go. 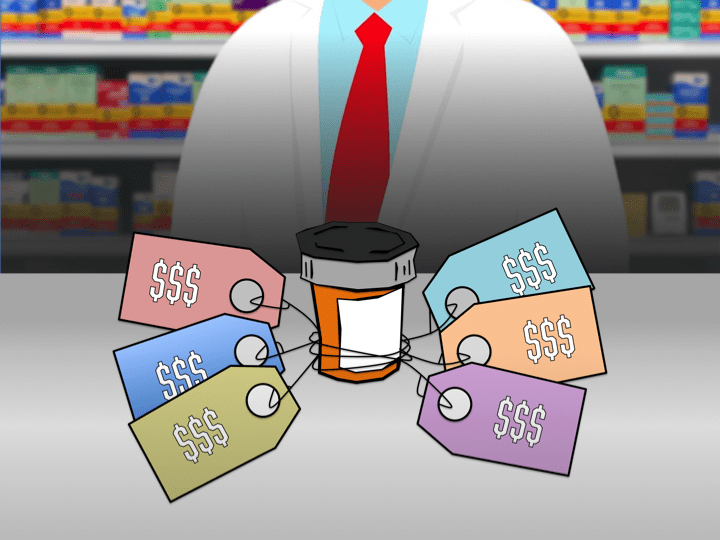 While an imperfect approach, the study implies that for every $100 spent for retail prescription drugs in the United States (both generic and name brand), about $17 covers direct production costs, $41 goes to the manufacturer, and $41 is split between wholesalers, pharmacies, pharmacy benefit managers (PBMs) and insurers as gross profit. Under their hypothetical calculation, the authors estimate a total net profit (after expenses) at $23: $15 goes to manufacturers, $2 goes to PBMs, $3 goes to pharmacies, and $3 goes to insurers. The gross profit margins fall differently for generic drugs, where manufacturers clear a much lower $18. However, the supply chain — and particularly PBMs – make more money with generics. PBM’s take in the generic market is $7, a four-fold increase, according to the study. From the PBMs’ perspective, it is largely up to drug makers to reduce the cost of prescription medications. “The most direct way for drug makers to reduce costs and improve access is to simply cut their own prices,” said the Pharmaceutical Care Management Association (PCMA), which represents PBMs, in an email to Tarbell. PhRMA did not respond to Tarbell requests for comment for this story. Experts say a primary problem in drug pricing is the relationship under which both powerful drug manufacturers and large pharmacy benefit management companies mutually benefit when a medicine price is high. How much money moves through this rebate/discount channel and what percentage actually ends up with the consumer? There simply is no way to know. PBMs tightly guard their contracts with manufacturers and treat them as trade secrets, like the recipe for Coca-Cola. Many of these companies also deploy tricks to retain as much of the rebate as possible. Some in Congress are pushing for new legislation to shed light on what’s really going on. One bill, the Creating Transparency to Have Drug Rebates Unlocked (C-THRU) Act, introduced by Sen. Ron Wyden (D-OR) in March 2017, would require PBMs to share their aggregate contract information online via the Department of Health and Human Services. It would also require a minimum percentage of rebate savings be passed through to the end consumer. Not surprisingly, the bill is unpopular with PBMs. PCMA, their trade association, warned the measure would give manufacturers and drug stores “unprecedented pricing power that could help them tacitly collude with competitors.” A later, PBM-industry funded study predicted the bill would cost the government $20 billion over 10 years. “Until we can see how much the PBMs are keeping for themselves—which is precisely the type of transparency needed—health care purchasers will continue to see higher costs, and the PBMs will continue to see record profits,” said Douglas Hoey, CEO of the National Community Pharmacists Association, in a statement. A PCMA spokesman declined to comment on the study. The C-THRU bill has been sitting on the sidelines with few co-sponsors. “People are clamoring for lower prescription drug prices, but since Republicans in Congress refuse to act or even hold a hearing, Democrats are the only ones offering solutions and calling attention to this broken system,” said Taylor Harvey, a Wyden aide. The Fair Accountability and Innovative Research Drug Pricing Act of 2017 would require manufacturers to report and justify monthly price increases of 10 percent or more to the government or face civil fines. The Stop Price Gouging Act would impose an excise tax on pharmaceutical companies that sell prescription that exceed the annual percentage increase in the medical care consumer price index. The Empowering Medicare Seniors to Negotiate Drug Prices Act of 2017 would allow the Department of Health and Human Services secretary to negotiate prescription drug prices under part D of the Medicare program. The Stopping the Pharmaceutical Industry from Keeping Drugs Expensive Act of 2017 would require drug makers to justify price increases to the Centers for Medicare & Medicaid Services. The information would be posted on the agency’s website. The Improving Access to Affordable Prescription Drugs Act is a catch-all bill that includes many of the requirements in the above measures. Neither the Speaker of the House nor Senate Majority Leader press secretaries responded to Tarbell’s requests for comment about the status of the pending drug price bills. The one solidly bi-partisan bill that seeks to address drug prices is the Creating and Restoring Equal Access to Equivalent Samples (CREATES) Act. It aims to speed the arrival of cheaper medicines by requiring name-brand companies to share samples and safety protocols with generic makers for FDA approval. Many branded drug manufacturers actively thwart the process to protect their monopolies. Despite a broad base of support, Republican leaders elected not to include CREATES in the final federal spending bill in March. The decision followed heavy lobbying from drug industry executives who flew into Washington to oppose the measure. There were some signals last week from House Speaker Paul Ryan that a compromise could be in the works. The Trump plan similarly seeks to address the problem. “We also have to get after the pharma companies who engage in anticompetitive practices to try to block the entry of generics,” said Azar. Exactly how the administration is going to achieve that and other suggested goals to reconfigure the drug supply chain to lower drug prices remains unclear.